Good morning! This week I have a short blog post that I hope will serve as a bit of a mid-winter pick me up! And for anyone in Canada this month, you'll be needing it. Speaking of winter, why is it that in February it feels like winter will never be over, and yet, in August we all feel that familiar dread at the knowledge that summer will indeed end? Anyway, on to the cookies! 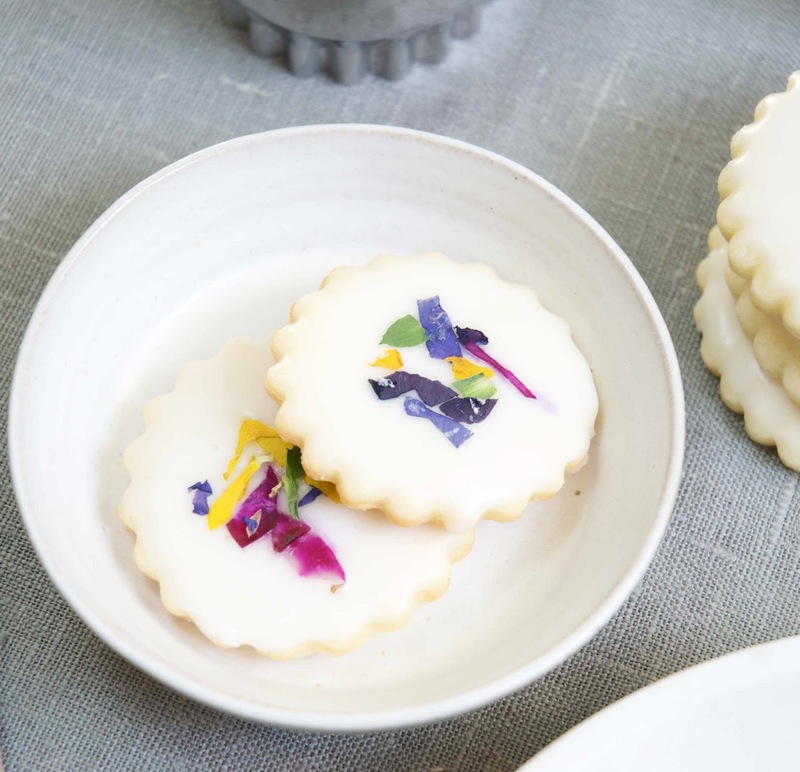 These edible flower 'stained glass' cookies are a fun way to add a bit of summertime colour to your week. I hope you like them. 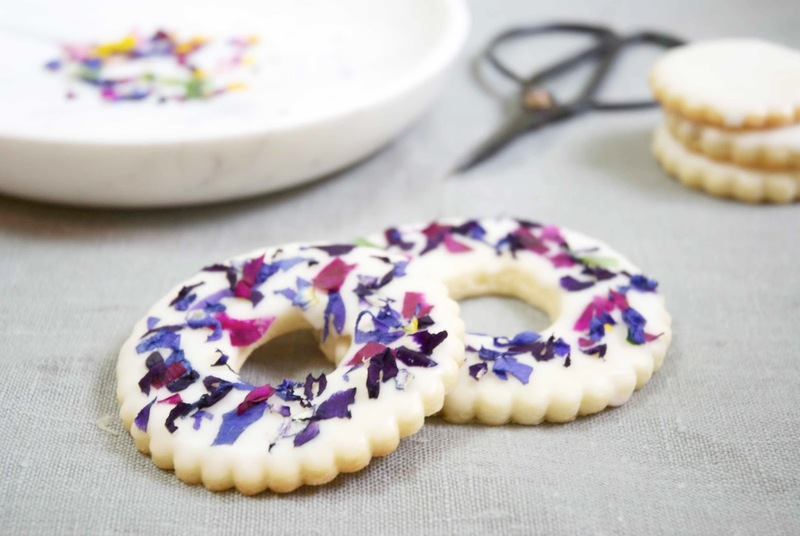 To make the cookies you'll need to purchase edible flowers. 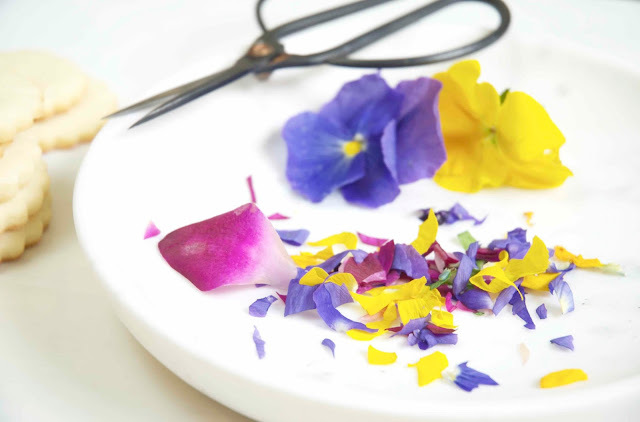 Most large grocery stores will stock packages of flowers with the packaged herbs. Look for the clear plastic boxes containing fresh dill and basil and you'll find pansies! 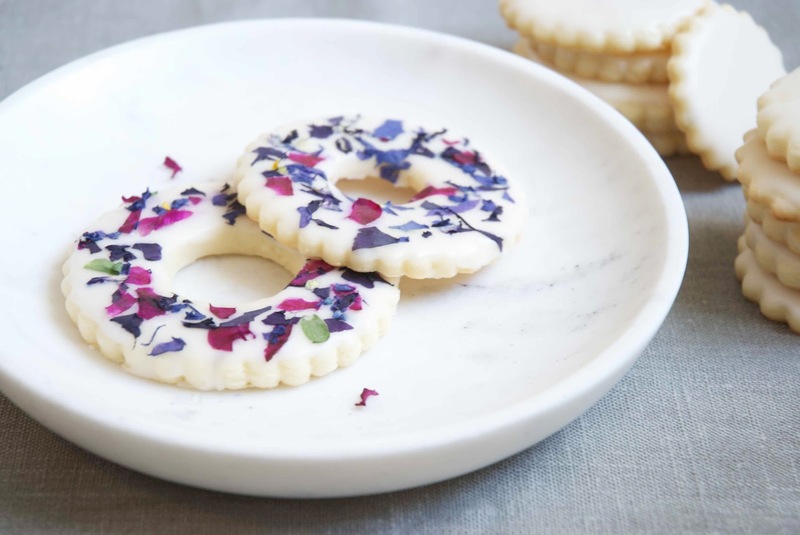 Once you have baked your cookies and and prepared a batch of icing, begin the decorating process by picking the flower petals and, using sharp scissors, cut them into little pieces. 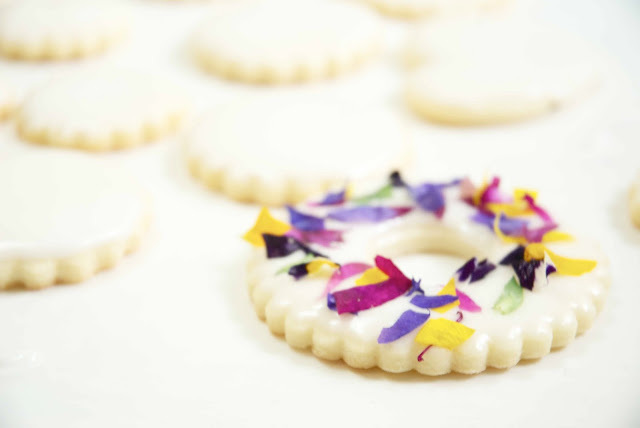 When you have a handful of petal pieces, it's time to ice the cookies. 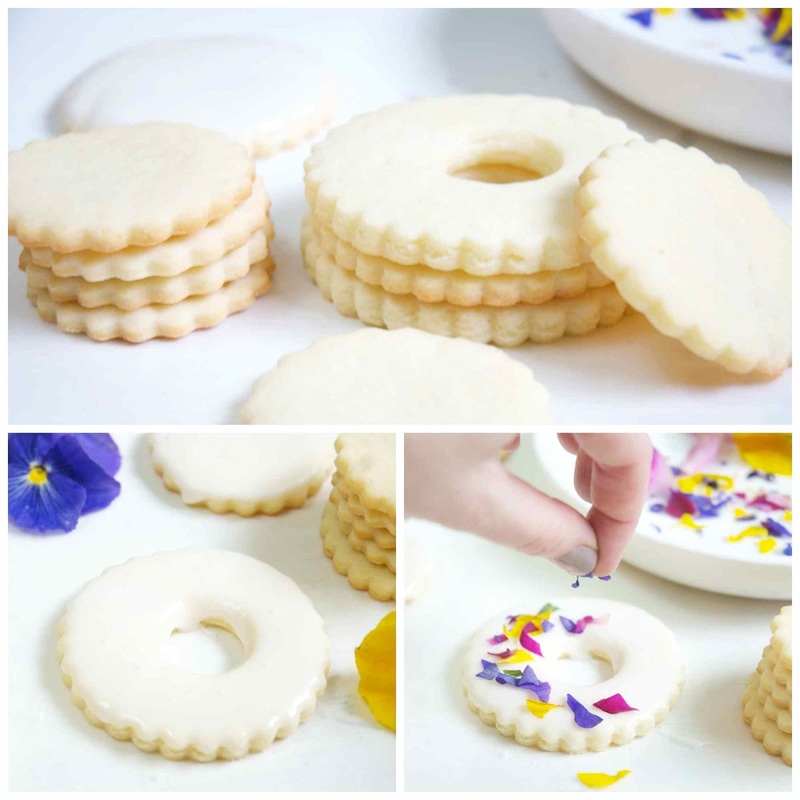 I've posted my sugar cookie recipe many times on the blog, and no surprise, that's the recipe I've used here. Cut the cookies in any shape you like, I used a scalloped round and a donut cutter. Once the cookies have cooled, frost them using a white glaze (icing sugar, one egg white and a bit of warm water), and while the glaze is still wet, sprinkle the cut petals on the cookie. They should stick and settle into the glaze. The fresh petals will slowly become part of the glaze; this preserves them and gives the cookies their stained glass look. 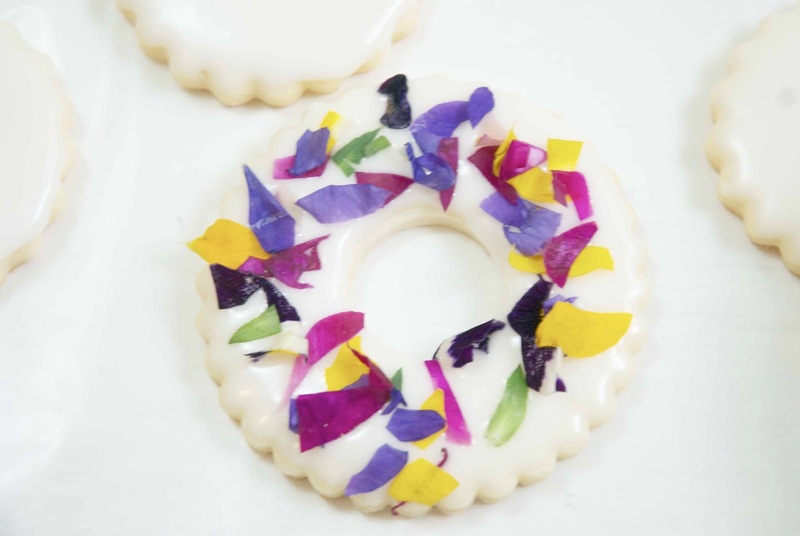 Some of the colour from the petals may even bleed into the frosting, I think this looks kind of pretty. We convey in more than 100 urban areas crosswise over India so you can remain associated with your friends and family amid celebrations as well as usual! Just can’t help to think, how a person can write such amazing stuff.